Material: 95%Polyester 5%Spandex. Length(shoulder to hem): 25. MISA Los Angeles. Size Small (S). Teal Whirl. JM Collection. Color: Teal Whirl. Types of Sleeve: Angel sleeve. Material: 5% Spandex, 95% Polyester. All at a price, you will love! Pattern & Print: Abstract print. Care: Machine washable. U:704974641602|Style:XCRZ0110|Rep:|schart:yes|Minutes:4|Am:create. Style: Blouse. 100% Authentic NY Collection. Sleeve Style: Batwing, Dolman. Material: Polyester |. Size Type: Regular. Material: Polyester. 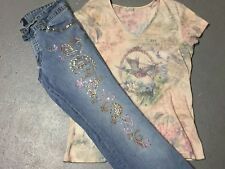 This listing is for a Women’s outfit in juniors size M/L size 11 jeans. The top is by Xcit USA it is a brown/beige top with bird design and pink bead accents. The jeans are blue denim with paisley and floral design. Beading down the legs. Beautiful set! Good pre owned condition. Lightweight and breezy. Sheer silk. Flounce sleeve. Peasant style blouse. 91% Silk,9% Elastane. Shoulder seam to end of sleeve: 25". Gold/teal paisley floral slinky fabric. angel style sleeves. 5% spandex. pull over style. 65% polyester. Size: Misses size Small. Top back length. Thin, lightweight textured fabric. but not limited to, cigarette smoke and pet odors. The overlay is semi-sheer with a lining underneath. 100% polyester. Shoulder to hem: 22". Armpit to hem: 12". Semi Sheer with. LOS ANGELES. Hi Low Hemline. LENGTH 28"-30". BUST 14"x 2 = 28". WAIST 17"x 2 = 34". ARMPIT TO ARMPIT 14". CONDITION: EXCELLENT. Shirttail hem. Shirred Short Sleeves. Color: Black Paisley Print. 13.5" across top; shoulder seam to shoulder seam. 24" from shoulder top to hem bottom. 100% Polyester. Hand wash cold, line dry. Pink tuck Front. Sequin accent on collar. Wide flip cuffs. Sleeve - armpit to cuff 18". WASHING INSTRUCTIONS Cotton fabric. Neck to hem 28". LOVE the pattern. Armpit to armpit 21". Paisley design. multicolored gem design right top. 17 sleeve (3/4 length). 25 pit to pit. ✽ Features: This is a very unique blouse, has ruffles around the neckline and a pretty cape attached at the neckline. ✽ Made By: Shengda from Pretty Angel. ✽ Material: 65% Polyester and 35% Rayon. STYLE: RED AND WHITE WITH PAISLEY PRINT FADED LOOK SHEER BURNOUT FABRIC ONE LEFT CHEST POCKET BOAT NECK SHORT SLEEVE STRETCH KNIT SHIRT. 45% POLYESTER 55% COTTON. CONDITION: VERY GOOD! 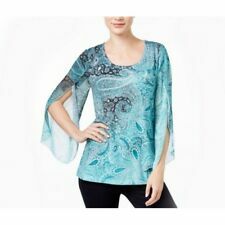 SIGNATURE JMB Sequins Beads Angel Sleeve V-Neck Pull Over Paisley Top Size S. Condition is Pre-owned. Blouson Gathered Hem Sleeves. 100% Viscose.Feels Like Silk. Length - Shoulder to hem: 23". Bandana Paisley Print. Small stains can often be removed with a little Shout & hand wash, cold water drip dry. Coral Silk. SPEED LIMIT NYC. ANGEL WING TOP. Coral Pink Red. a pulled or loose thread, a missing sequin or bead, signs of machine washing, etc. Embellished gold beads on bodice. Lined bodice. INC International Concepts Paisley Glamour, Sunset Glow Blouse. Paisley print in pink, orange, yellow, tan. Length: 26" (from collar). Good=May have a few minor flaws. Excellent=Like New Condition. Great=Very minor signs of wear. Style/model: A430208. Intimates & Sleepwear. Athletic Apparel. Pattern: Paisley. Style: Blouse. Fiber Content: 97% Polyester, 3% Spandex. If you do not see the accessory in the photo, it is not included. For allergy reasons: I have a dog but he is never around the clothing! Length shoulder seam to hem 28.25”. COLOR: CHARCOAL GRAY. SIZE: SMALL. 100% Cotton. Fitted style. Short sleeve scoop neck t-shirt. Height : 5' 8". Weight : 130lbs. This is pre-owned and may show minor wear. I did not notice any flaws. There may be slight variations of color due to lighting. Teal, cream and brown paisley design. Halter style ties at neck and around back. 2" wide brocade gold and aqua ribbon under bust around whole tank. Design: Pull Over Tank. Size: Small. Underarm to underarm (laying flat): 140". It might be a half shirt. The sleeves are 24" from shoulder seam to cuff.